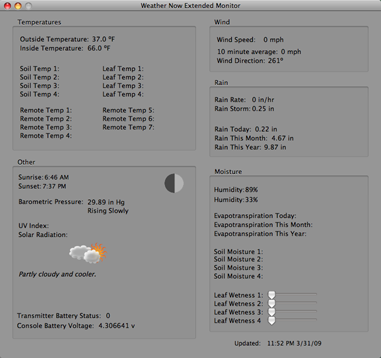 Weather Now version 2 hooks your Mac up with your Davis Vantage Pro weather station. 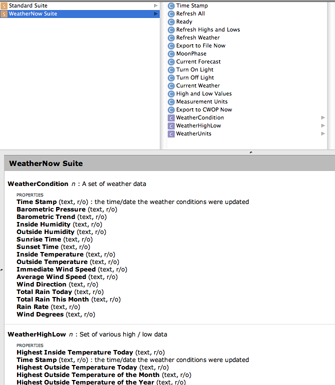 You can get real-time weather data on your screen, log that data out for future analysis, or use AppleScript to get that information to virtually anywhere. New in v2.4: Twitter your weather, or display it on a Roku SoundBridge!�Additional updates listed on the 'What's New / History' page. Note: These screen shots are from v2.3 and do not yet reflect additional features added in v2.4. This first picture is the main window. You can see the common information, such as indoor and outdoor temperature, the wind speed, how much rain has fallen, and the current conditions in picture form. The current condition graphic will give you the forecast if you hover your mouse over it. The second screen is the 'extended monitor' window. This one shows additional information that your Vantage Pro can report, that you may not always be interested in. I should have hooked up my soil temperature sensors so the screen shot would be more compelling, but we're redoing our landscape so they are in boxes. Next is the 'highs and lows' window. Daily, monthly, and yearly extremes as recorded by the Vantage Pro (so this does not depend on Weather Now to have been running to record the data). 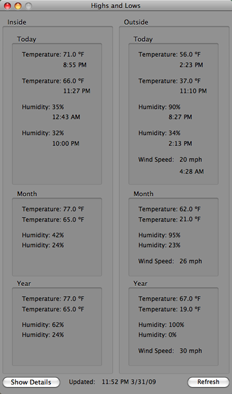 This tiny screen shot shows two of the 'floating windows' displaying current indoor and outdoor temperature. 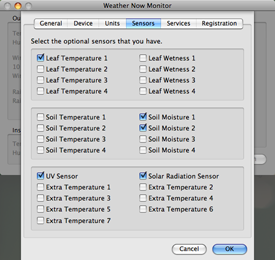 These float above other applications, so you don't need the full Weather Now window in the front to see what the temperature is. There is also a floating window that can turn the console's backlight on and off, mostly for fun. Here you can see the page to select between some common measurement units, the page to set automatic refresh intervals, log file location, and the communication verification / diagnostics results. And in this somewhat hard-to-read screen shot you can see part of the AppleScript dictionary. 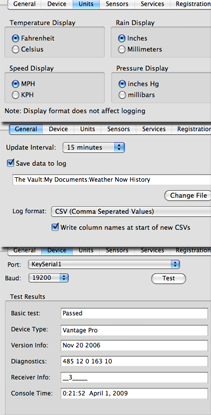 The point is that there are AppleScript verbs (or commands, depending on your preferred wording) to get weather conditions and then nouns (classes) that are organized and named to make it easy to create Weather Now AppleScripts. You can download Weather Now from the Download section of this website, or via the Weather Now VersionTracker page which may be faster since it has (what I assume to be) the massive Download.com datacenter serving it. If you enjoy the software I'd appreciate a positive review on the VersionTracker Weather Now Ratings / Feedback page. If you have a question or problem please use the Xada Tech Forums on this site to report it, I get notified when a post goes on to my forums so I'll be able to respond quickly. To purchase the full version of Weather Now you can either use the 'registration' settings page or visit the Xada Tech Kagi Store.